Today is World Rabies Day 9/28/2009. What a great reminder for us all to check the vaccination records of our pets. If you have been to any of the great Knoxville dog parks then you know that a rabies vaccination is a requirement for your pet. It also just makes good sense to protect your furry friend. An e-friend of mine and I were discussing World Rabies Day when she sent me a link. East Tennesseans already know that we are lucky to live in the Knoxville area. It's a beautiful place where people are friendly. But until my friend sent me the link for this article I had no idea that Knoxville researchers contributed to the prevention of infection in horses. 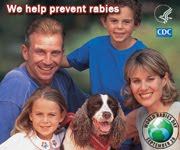 Visit the World Rabies Day website for more information by clicking the link above. If you are interested in getting involved with a pet group in the Knoxville area visit the website of KnoxPets.Org. There is a long list of activities and groups that pet owners (and pets) might be interested in.